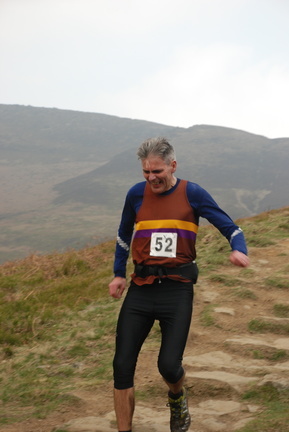 Fell running is an extreme sport and injuries and fatalities do happen. Dark Peak does not take responsibility for anyone who runs with the club on organised events, it’s therefore essential that each individual takes responsibility for his/her own safety. To enable members to develop the skills required to understand the risks of being out on the fells, the club offers all members courses in navigation, mountain craft and first aid. There are also a number of professional mountain guides, mountain rescue and medics in the club that are always willing to offer advice on many aspects of the sport. Checking the weather forecast for the area you are running in is essential. The climate in a city centre can be a world away from what it’s like on the top of Kinder Scout. What kit you wear and carry depends all four of the items above. At a minimum, and in line with FRA best practice guidelines, you should carry full body cover (waterproof or windproof according to conditions), spare top, hat, gloves, space blanket, torch, spare batteries, map, compass, whistle and emergency food. Extra items could include a light bivvy bag or 1-2 man emergency shelter and first aid kit. On a Wednesday night at least one person should have the full kit listed above. Distance – how far in total? and how far between significant points en route? Duration – how long will it take overall? And between significant points? Destination – clarify to yourself and with others where you are actually trying to reach and have in mind a feature which will tell you if you have overshot. If you apply all of these rules to your route it will lessen the probability of getting lost. Missing any one increases the risk of error. If you have a satnav or altimeter, these can also be used to aid navigation but should always be used in conjunction with map and compass and should never be independently trusted due to the risk of technical malfunction. Your individual personal circumstances are of course unique to yourself but take in to consideration, what you have eaten during the day and does a family member or friend know where you are going and what time to expect you home. If you take medication, let somebody know in the group and if you are new to the club, let a fellow runner know where your car is parked especially if you have travelled alone. Be aware that in races the risks of becoming isolated or exhausted is increased. Do not be tempted to travel light. Although we do attempt to identify new club members, at night it can be challenging, so if the person making announcements fails to identify you, do approach someone and introduce yourself.